The next time you have a chunk of time to devote to your genealogy research, spend it organizing and analyzing what you already have. Do not perform Google searches, do not use FamilySearch, or any other website, database, etc. For that block of time for yourself to organize and analyze what you already have. The discoveries you make could surprise you. Information for any record can be provided under less than ideal circumstances. Death certificates contain information than can easily be given at a time when the informant is tired, distracted, and even slightly confused about who their mother-in-law’s mother was or where the deceased’s father was born. Keep this in mind if the informant gave “unknown” or a location that is really off. Do You Need It In Color? Is it possible that a color scan or copy of a document or record might indicate clues that are not as easy to see on a plain black and white copy? Even sometimes a grayscale scan may show some nuances of shade and different colors or handwriting. This image which we’ve discussed elsewhere makes a simple illustration. Always analyze a date in the context of other events taking place at about the same time. In comparing the death date of my great-grandfather with the date the will was brought to court for recording, I realized the dates were close–the date of death was 1 February and the will was brought for recording on 3 February. The time frame was even closer than I thought. The great-grandfather died on a Saturday and on the following Monday the potential executor brought the will to be recorded. 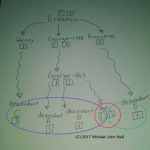 This was the first business day after the ancestor died–meaning that there wasn’t really any delay at all–the executor didn’t mess around. GenealogyBank–our sponsor–is offering a special for new subscribers to their services: a discount and a free ebook on searching for obituaries in newspapers. GenealogyBank has exclusive content and the offer rate is less than $5 a month. Are you aware of who created the document you are using in your research? Was it a census taker, records clerk, local pastor, etc.? It makes a difference as who probably created the document impacts how much crededence is given to the information the document contains. Did the creator of the record obtain the information from their own first-hand knowledge or did someone else likely provide the information? If you have not seen a document or record yourself, do not list it as your source. “My cousin looked at the marriage record and said it says Blah” does not mean that you looked at it and it said “Blah.” There’s always a chance you cousin is incorrect. Look up the document yourself. Why Was The Record Created? Do you know the original purpose of the record you are using for your research? It most likely was not genealogy. Land deeds were created to transfer real property, tax records were used to document the wealth of an individual so that taxes could be collected, court testimony was used to gather evidence to make a decision in a specific case, etc. Why a document was created impacts the information it contains and how reliable that information may be perceived for genealogy research.